All shops will be closed on Easter except Liberty Station! We can ship almost any cheese. Call us at 619-376-1834 to chat with a monger. 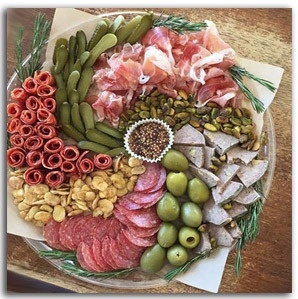 This meaty assortment of crazy good charcuterie includes three types of salumi, decadent pate, crisp cornichons, delightful olives, crunchy nuts, a zesty spread plus a French baguette. Include plates and napkins by adding the ADD PLATES & NAPKINS item to your order. This tray is presented on a 14-inch reusable crystal clear platter along with name tags and seasonal accoutrements. This photo is an example only as trays are like snowflakes - no two are alike! You can email your custom order request to us (please be as detailed as possible). Or call your neighborhood shop. Copyright © 2019 Venissimo Cheese.